It’s not usually a good thing to be known as lazy but in the case of Argon, it’s a label that has been used to describe the gas since its’ discovery. The name itself is derived from Argos, the Greek word for inactive and pays homage to the gas’ non-reactivity. That non-reactivity is one of the reasons Argon gas is so valued by so many industries. Argon gas is inert, colorless, and odorless in both its liquid and gas forms. This makes it a Noble gas in addition to a “lazy” gas. Since Argon is inert, it is widely used in processes that require a non-reactive atmosphere to protect materials from oxygen or other gases in the atmosphere. You’ll find it in gas-filled lights, as a shielding gas used in arc welding, as an insulator, to grow silicon crystals, and in historical preservation, among many other uses. Argon is found naturally in the atmosphere and actually makes up nearly 1% of the Earth’s atmosphere making it the most abundant (and least expensive) of the Noble gases. Operators choose Argon gas for these reasons and also because it does not react with other elements or compounds, even in high heat applications. It can be safely counted on not to destroy whatever is being produced or protected. That is not to say that Argon is 100% safe. Care must still be taken when working with the gas. Because it is colorless and odorless, it’s hard to gauge exposure to the gas, which can be inhaled and lead to risk of suffocation if it displaces too much oxygen. Fortunately, the gas dissipates rapidly in the environment, so as long as it is used in areas with strong ventilation systems, respiratory distress can be avoided. Liquid Argon is incredibly cold and can lead to frostbite on contact. Liquid Argon should be handled as you would handle any cryogenic liquid. 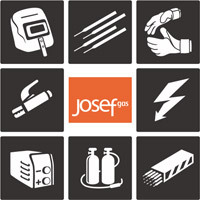 Josef Gas offers 100% pure liquid Argon as well as blends with other gases like Carbon Dioxide, Helium, Hydrogen, and Oxygen for all of your welding and specialty gas needs. We carry many mixes and grades and would be happy to help you find the right Argon gas. Contact us at 416.658.1212 for advice and personalized service you won’t find elsewhere.